Read our reviews and get tips and ideas for great trips around Peralta. I have just come back home from an amazing place nestled in the hills of Tuscany, Italy, called Peralta. What a wonderful get away – tranquil beauty, peace and quiet. I traveled solo for three weeks in March and didn’t really know how everything would go. From the very first day it was SO much more than I expected. The beauty, the service, the people. Kate, the care taker of the Villa, went out of her way to make sure I was well taken care of and really enjoyed her place in the villa. Thank you so much Kate for everything! Out of all the places I visited during my trip, I always couldn’t wait to come back “home”, in my quiet place, in touch with nature. I’m so blessed I found Peralta, especially to have a chance to get to know its people. It was hard to leave. I know I’ll be back. Very soon. And I’m sure many of my friends will be visiting as well. Peralta is a perfect getaway for a lazy vacation, and it fulfilled our every expectation. I would recommend it without hesitation to anyone looking for a relaxing and sensual experience. Peralta was originally the dream of Fiore, a sculptor whose exquisite work graces this property and some of the houses. She lived and entertained friends and family in ‘our’ house, Casa Nuova, before her death a few years ago. The narrow, winding road that leads to Peralta is a little tricky but manageable. (A word to the wise: Rent a small car.) But when my husband and I saw the little cluster of rustic stone houses that make up this hamlet, we knew we had arrived in Paradise. Groves of olive and fig trees cover the slopes. Magenta bougainvillea trail from the walls of the rustic stone houses and pots of hydrangea line the stone steps. 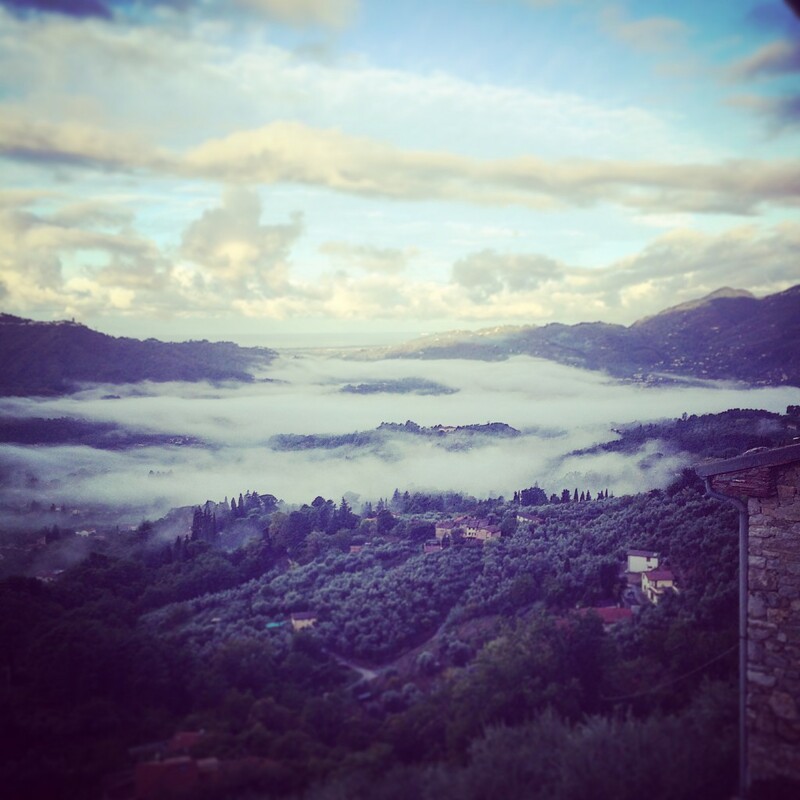 Spectacular vistas look down on the town of Camaiore and stretch all the way to the Tyrennian Sea. Our accommodations at Casa Nuova were spacious, clean, well-kept and comfortable, and as beautiful as pictured in the photographs. There is also a communal terrace across , but each house has its own private terrace. There are several good restaurants in the area, but we enjoyed shopping in Camaiore for fresh produce, meat and cheese and cooking dinner for ourselves. We had the best view in town as we relaxed over dinner on our wisteria-covered terrace and watched the sun go down! We loved swimming in the pool at the top of the stone steps. There are walks you can take up into the hills; the staff supplies printed directions. There are many small towns in the area to visit, as well as Pisa and Lucca, which are an hour away. The marble quarries of Cararra are just north. 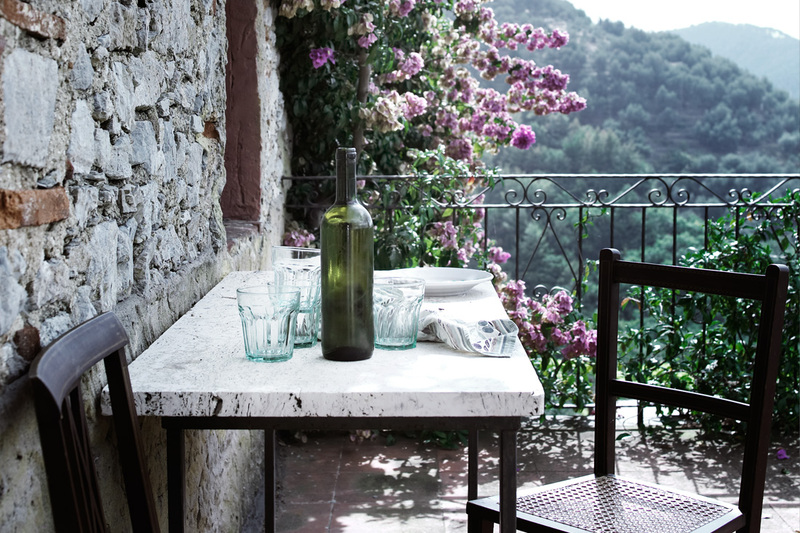 Fiore’s compassionate, convivial spirit lives on in this lovely hillside hamlet and the staff who made our visit such a pleasure. Dinah and Kate could not have been more friendly, accommodating, and efficient. Someonewas always around if we needed anything and happy to assist us, including recommendations for restaurants and places to see and directions too. We were so happy with our stay last summer that we are returning this summer and can’t wait to see everyone again. P.S. to this review: Katherine and her husband Larry have stayed at Peralta every summer since this first time in 2007. In 2017 she wrote a further review for us. I was looking for a romantic destination with Tuscan charm and in a beautiful countryside setting and Peralta did not disappoint. This property was even more than I had hoped for. Stunning views and a wonderful staff. Dinah, Kate, and Christopher were so helpful and friendly. They were always there if we needed something yet we had plenty of privacy. When we needed to extend our stay on short-notice, they were very accommodating. 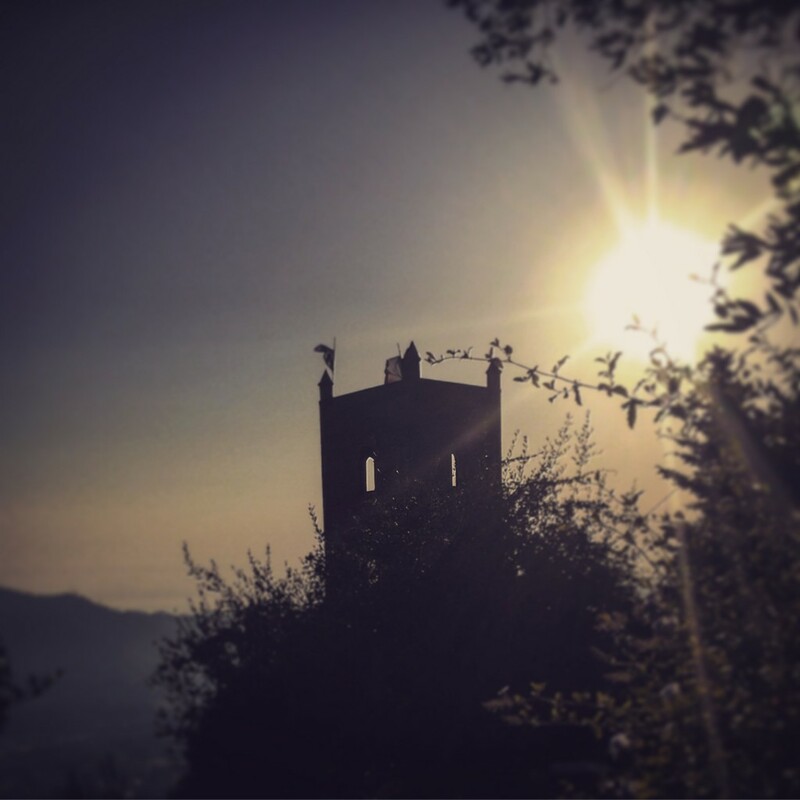 Peralta is a 25 minute walk to the small village of Pieve where we enjoyed delicious food with great service and a 45 minute walk from Camaiore full of friendly locals. We loved this place and plan to return next year! Peralta is a special place in Tuscany, we booked a 9 day stay for our honeymoon and had an incredible time. Both Kate and Chris were very welcoming and helpful. We took our 20 month old son with us and at first were a bit worried about the steep drops from the footpaths but it was fine when we arrived. Harry loved exploring Peralta and climbing the stairs to the pool, and of course running after the dogs Ellie and Bracha. The views from our balcony and from the pool were amazing, we will miss the sunsets at Peralta. We were seeking a relaxing holiday with an authentic Tuscan charm and a tranquil setting, and Peralta ticked all the boxes. For two adults and one child, STUDIOLO was the ideal set-up to pass peaceful days that seemed to never end – might sound like cliche that, but this is just how it was. The self-catering apartment was furnished in a traditional rustic style, with basic bathroom fittings and decorated with emotive sculpture and paintings by Fiore de Henriquez. We cooked daily using the kitchen and any needs were immediately accommodated by the extremely warm and welcoming Kate. As we walked across the hills between the olive groves we came across lemons, cherry trees, figs, vines and wild herbs growing in their natural environs. 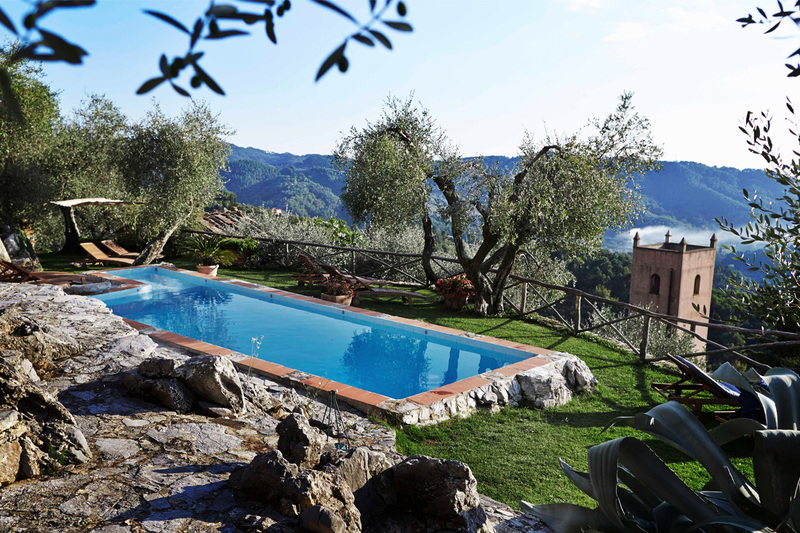 The relaxing and clean pool overlooked a breathtaking view of the valley below with the towns of Camaiore and Pietrasanta in the distance. Trips to local shops and markets meant we were able to stock up on the finest food and drink that Tuscany has to offer. The beach was only a short journey away but we preferred to unwind and relax at Peralta for the most part. We returned from our week there completely re-energised! Absolutely perfect for our needs. We have been back on many occasions and Peralta continues to rejuvenate. It’s a real treat, retreat on repeat! We’ve already booked our next return. My husband and I have spent a month at Peralta every summer for 10 years, and we will be there again this year. We love its peaceful serenity. 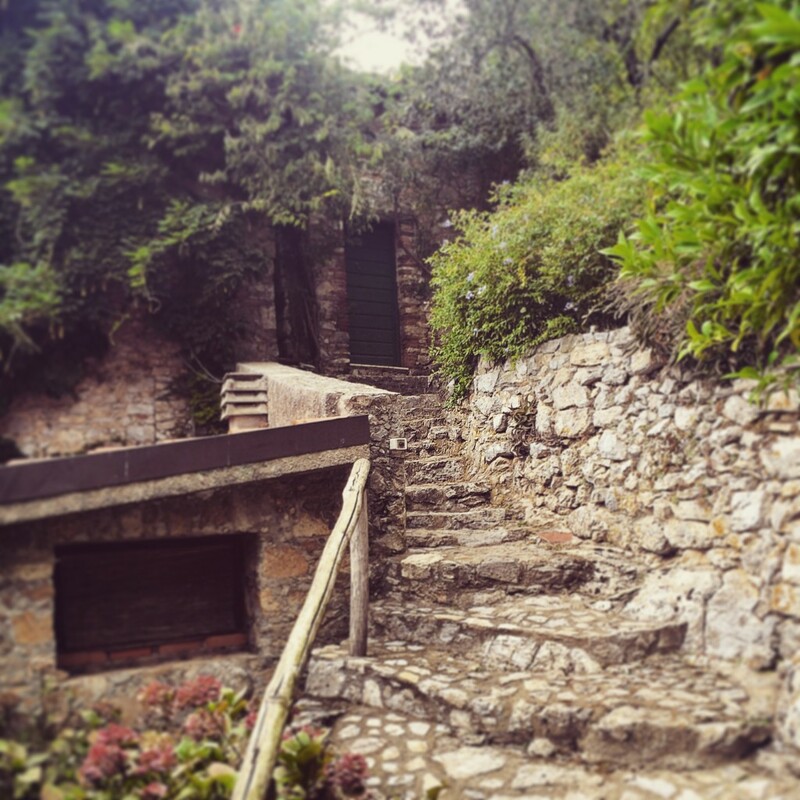 The path to Casa Nuova from the car park is a pleasure in itself. It’s filled with birdsong and cicadas, and lined with sweet-smelling jasmine, fig trees, and bougainvillea. Casa Nuova, where we always stay, is ideal for us, with its large, wisteria-covered terrazza and its spectacular view of the valley below and, on clear days, the Mediterranean Sea. Peralta was once home to sculptor Fiore Hendriquez, and her sculptures keep the artistic spirit of the place alive. All of the stone houses at Peralta are comfortably furnished with rustic antiques and have private terraces and beautiful views of the valley. The hike up stone steps takes you to the swimming pool and an even more expansive view. Dinah Voisin, the owner, and Kate Simova, Peralta’s manager, are a delight and extremely helpful and accommodating in making sure that your stay is everything you want it to be. My girlfriend and I spent a week at Peralta Tuscany in September 2016 and had an absolutely magical time. It is a special place. We stayed in Gemelli, a self-catering apartment with breath-taking views across the valley below and out over Peralta’s main large terrace. Gemelli has a good sized bedroom with a comfy large bed and en suite, a small kitchen, living space with wood burner and arms chairs and even our own private terrace – perfect spot for a morning espresso! 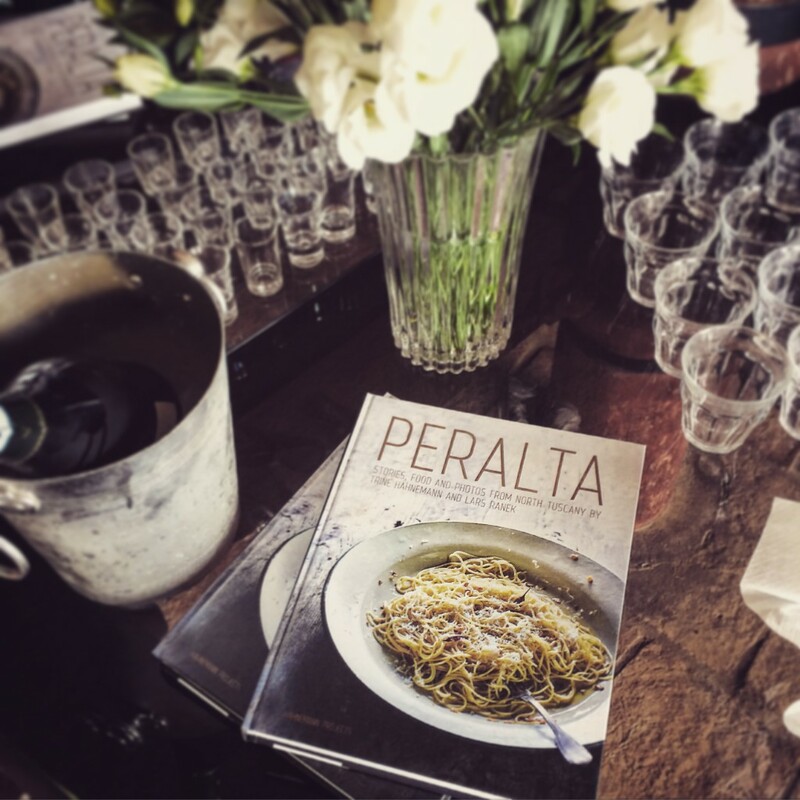 We absolutely loved Peralta with it’s traditional rustic Tuscan feel. There are so many charming nooks, crannies and pathways it feels there is always a private spot to read a book or simply take in the views. The pool area is great, located at the top of Peralta it is the perfect place to watch the sunset. We also visited Pietra Santa and Lucca nearby which we really enjoyed, both well worth a day trip. We could not recommend Peralta highly enough and will be back! This was one of those holiday experiences that will always stay with us. We came to Europe from the New Zealand winter, discovered Peralta online and booked it at the last minute. Everything about it was sublime. Our house (Casa Giovanni) was perfect – private, beautifully furnished, artfully decorated, very comfortable, and with expansive views you can gaze at endlessly. The hamlet is peaceful, charming, and its long history fascinating. Its relative isolation makes it all the more special, and the road in is not as dire as it might sound (when you have conquered it once, and provided you have a small car!). The walks are delightful, and the local flora fascinating. The store down the road provides wonderful locally grown produce. We felt very welcome, and so at home. Our stay here with family members was all too short. We would love to return for a longer time to settle into its benign ambiance. This was one of those holiday experiences that will always stay with us. We came to Europe from the New Zealand winter, discovered Peralta online and booked it at the last minute. Everything about it was sublime. Our house (Casa Giovanni) was perfect – private, beautifully furnished, artfully decorated, very comfortable, and with expansive views you can gaze at endlessly. The hamlet is peaceful, charming, and its long history fascinating. Its relative isolation makes it all the more special, and the road in is not as dire as it might sound (when you have conquered it once, and provided you have a small car!). 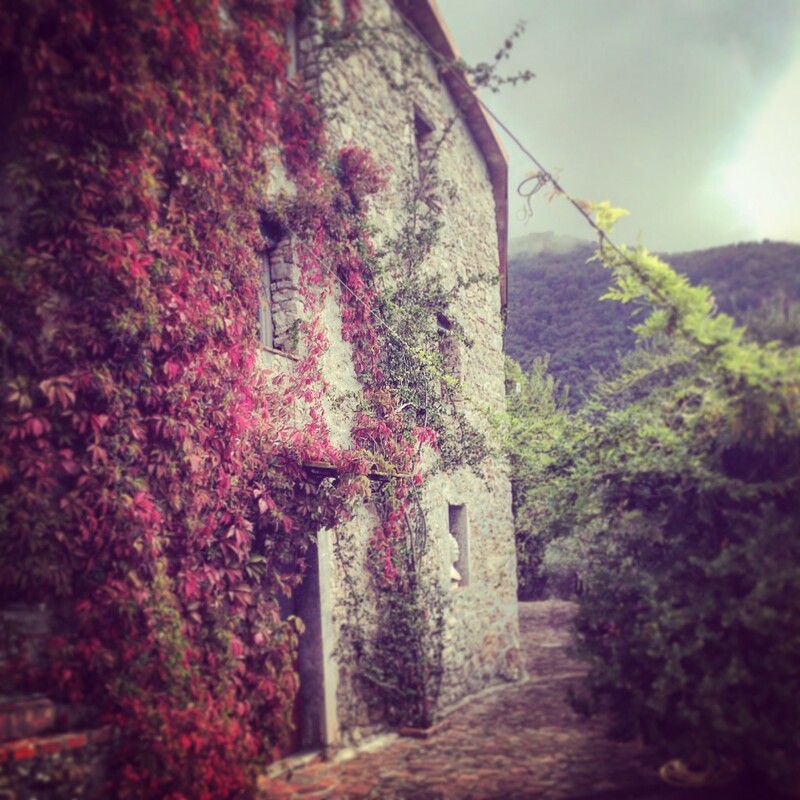 We stayed in Peralta (Casa Luigi) with 7 persons for one week and we loved this special place. The house, the nice pool, the great views and the lovely people contributed very much to the wonderful week that we had. Kate and Chris were very polity and we really appreciated their help and hospitality during our stay. We loved the pool and the nice views from our terrace. Besides we had a very interesting introduction about the story of Peralta and Fiore de Henriquez’ sculptures that are still in Peralta. We loved it very much. We really hope to visit Peralta in the near future again and we can recommend other people to visit this nice place! 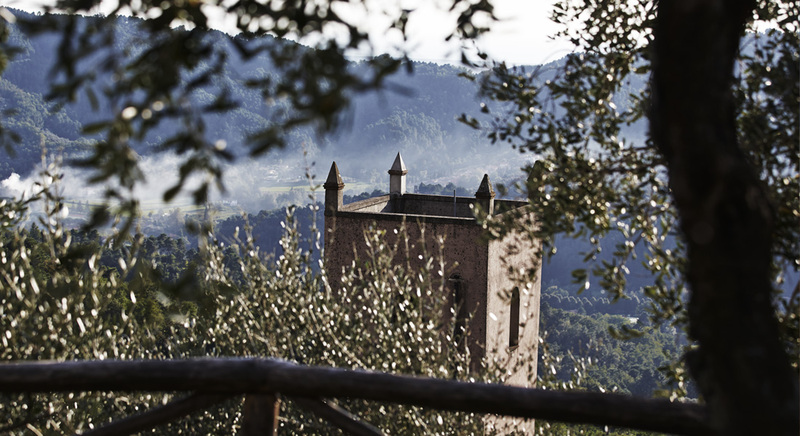 A relaxed, inspiring atmosphere with a stunning view where you can either keep to yourself or be amongst the fabulous Tuscan world while feeling like you are in Italy proper, not just a tourist. The relaxed but highly organised and knowledgable Kate was available for anything we needed. Our villa, Casa Luigi, had plenty of space, was perfectly clean and had just the right amount of mod cons to be rustic but practical. The beautiful quality and impressive quantity of Fiore de Henrique’s works scattered around enhanced the inspiring atmosphere which considering the view was a surprisingly pleasant added joy. The nearest restaurants were equally relaxed and provided delicious local food; our favourite was C’era Una Volta from which they willingly provided us lifts back up to Peralta. Visits to Pisa, Florence, Lucca and the beach at Viareggio were not only highly recommended but also easily manageable. Teenagers and adults got so much from this change from our everyday lives. We hope to be back with the rest of our brood soon! Enjoyed every minute of our holiday here. The house had everything we needed for a family of 5 – including essential wifi down the hill for our 3 teens! The hilltop pool was a real bonus – felt like swimming on top of the world every evening, with the sun going down, turning the sea and sky golden. Kate and Lee were so friendly and helpful when needed for any questions or practical help but also melted into the background and worked away behind the scenes the rest of the time. 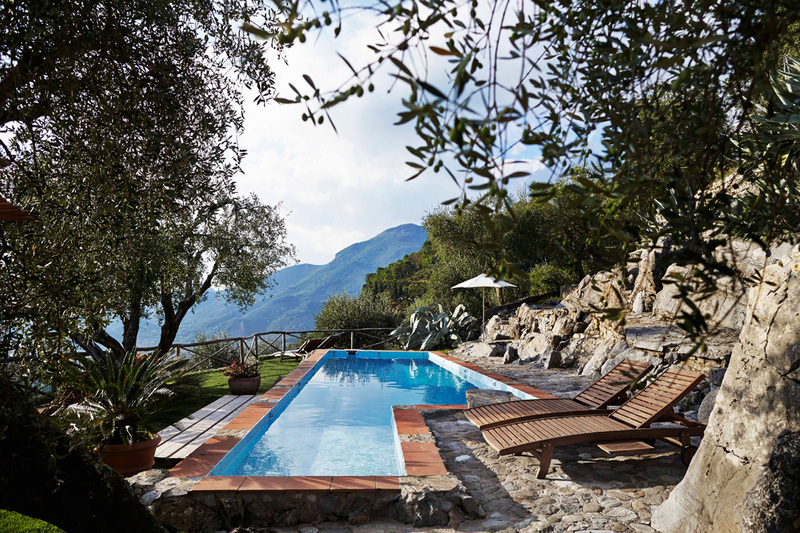 Peralta is such a fabulous, peaceful hideaway and yet close enough to explore towns and cities – Lucca is a real gem, then of course Pisa and Florence are fabulous too. The lake in the national park is well worth the trip too, especially the boardwalk trail from Massaciuccoli, where we were delighted with 3 new bird species! Eating out was a great experience too, from the corner pizzeria down the hill, to the many and varied options in the cities. Don’t forget to try out the amazing ice-cream shops too! The corner shop down the hill stocks all essentials including fresh bread in the mornings and is worth the visit just for the parmesan grating machine and the lovely shopkeeper of endless patience and smiles who clearly appreciates the extra business, even is she has to mime for it! Peralta is a place you’ll find it very difficult not to fall in love with – not least the house ‘Casa Luigi’ we rented and shared with our friends this time. 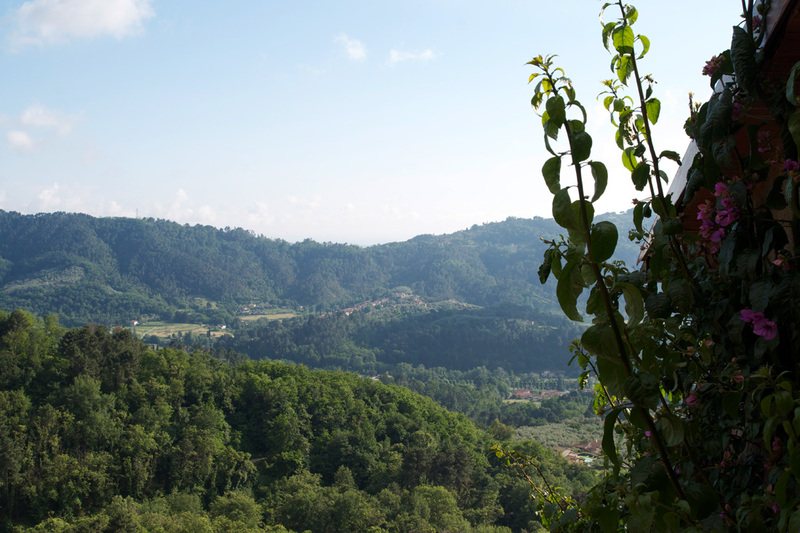 4 adults, 4 children, plenty of space and a wonderful terrace overlooking the hills and valleys of Tuscany. There’s a vibe to Peralta that we haven’t found anywhere else. Maybe it’s Kate and Dinah and their numerous friends who run the place, maybe it’s the art of Flore de Henriquez that meets your eye no matter where you go – or maybe it’s the good old concept of trust and headspace. Ah, the peace and quietness of this place, the fresh air of the mountains, the breathtaking views..I can see us all returning year after year, This really is a place like nowhere else. This was the 6th time I’ve been to Peralta so I more or less knew what the deal would be… fantastic as always. However, I never stayed at Casa Nuova. This year I decided to book the house for our honeymoon and what a treat it was. Even after coming here for a few years now, this place managed to amaze me. It’s very spacious and all the necessary accomodations are in place. The athmosphere is very special and the view from the private terrace is stunning. It’s also an excellent place to have a nice honeymoon barbeque 🙂 ! If you want something special and relaxing, this is the place! My wife and I had never stayed in a setting like Peralta and we would stay there again without hesitation, though someone might have to drive us up those final, hairpin curves! A small car is required definitely. Descriptions of Peralta from its website and reviews from other customers were accurate: the overall layout of the hamlet and the individual apartments were even better than we expected for their attractiveness and suitable accommodations. The manager and groundskeeper were knowledgeable, helpful, and friendly. They made us feel at home. Peralta provided each apartment with a very informative booklet about Peralta itself, the surrounding community, day trips, hikes, and restaurants. We found its guidance helpful and up to date. Wifi service was haphazard for several days. It was determined to have been a community problem, not Peralta’s. The manager was a strong advocate in having the cable company remedy the problem. We can be counted as very satisfied customers who have already recommended Peralta to others. Peralta – Just a name that means nothing until you’ve wound your way through the sleepy little town of Camiore with its mom and pop stores bursting with fresh local produce and smiling happy shop keepers. 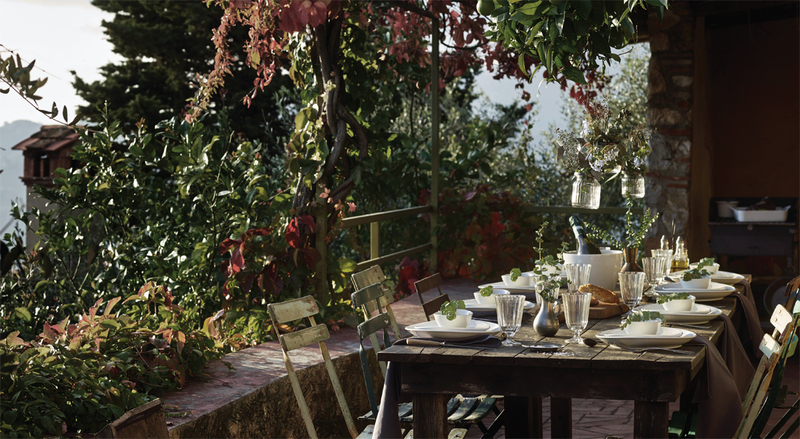 Life moves at its own pace here – and one begins to feel the love of Tuscany. The excitement builds as you drive up steeper and narrower roads hooting at the hairpin bends to alert any oncoming cars, until you reach the parking lot at Peralta. Then the view hits you and its enough to take your breath away. Stretched out before you is a heart aching vista of Tuscan villages and hamlets away to the Mediterean sea with the island of Elba in the distance. You are home, not your home but the home of your heart. Peralta , with its amazing sculptures and ancient buildings so sensitively restored, fulfilling the life vision of Fiore , the artist sculptor who found the tumbled down ruins of a hamlet high in the hills above Pieve. Fiore had the dream of creating a place where artists could come and feed off its soul energy and find inspiration. We found it and lost a piece of our hearts. The place , the people, the view , the food, the love , all imbue Peralta with a power that once felt can never be forgotten.When i think of Italy, I think of Tuscany and Peralta, and for us forever, all roads lead to Peralta! We are counting the days until we return , amore! Libbi wrote : We stayed in Pipistreli apartment. It had absolutely everything we needed for a couple to spend a few relaxing days in the most beautiful location possible. Everyone at Peralta , whether they work there or are guests, …are wonderful souls. Thank you for the most memorable holiday ever! Wer etwas ganz besonderes, abseits des Massentourismus sucht, ist hier genau richtig. Hier kann man wunderschöne Sonnenuntergänge auf der Terasse genießen und wird morgends durch ein Vogelkonzert in den Tag begleitet. Man wohnt in liebevoll restaurierten und charaktervoll eingerichteten Häusern und begegnet auf dem gesamten Gelände imposanten Kunstwerken. Dabei wird man perfekt durch die unglaublich nette Verwalterin begleitet, welche immer einen Insider Tipp hat oder einen tollen lokalen Wein für den Kühlschrank besorgt. Immer wieder gerne!!! My husband and I have spent a month at Peralta every summer for 10 years, and we will be there again this year. We love its peaceful serenity. 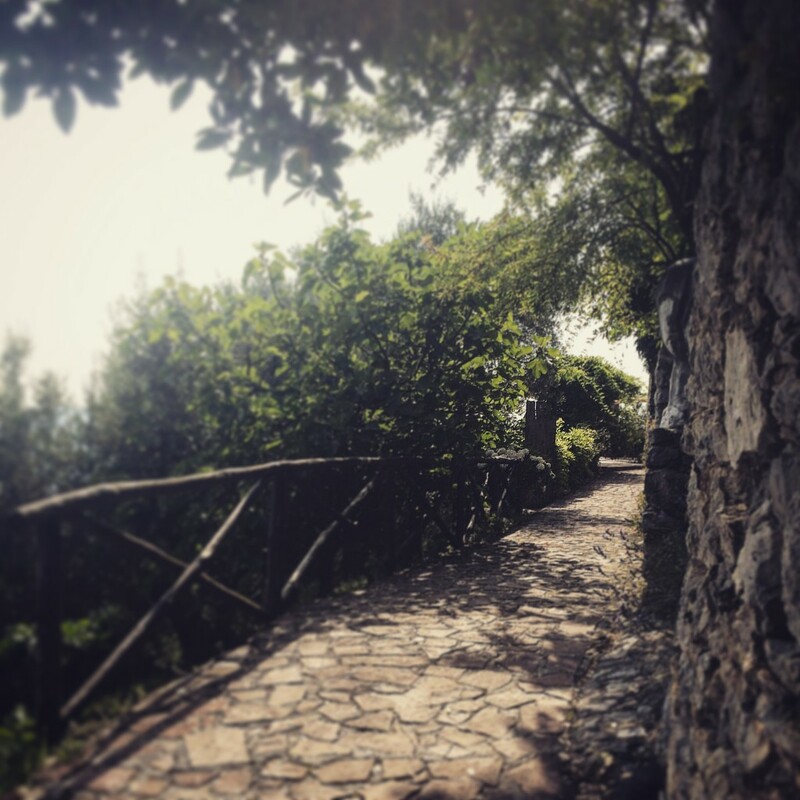 The path to Casa Nuova from the car park is a pleasure in itself. It’s filled with birdsong and cicadas, and lined with sweet-smelling jasmine, fig trees, and bougainvillea. Casa Nuova, where we always stay, is ideal for us, with its large, wisteria-covered terrazza and its spectacular view of the valley below and, on clear days, the Mediterranean Sea. Peralta was once home to sculptor Fiore Hendriquez, and her sculptures keep the artistic spirit of the place alive. All of the stone houses at Peralta are comfortably furnished with rustic antiques and have private terraces and beautiful views of the valley. The hike up stone steps takes you to the swimming pool and an even more expansive view. Dinah Voisin, the owner, and Kate Simova, Peralta’s manager, are a delight and extremely helpful and accommodating in making sure that your stay is everything you want it to be.